Sarah Case and her 9-year-old Sheltie, Coco, were crossing Agate Street in front of Hamilton Hall on their way to class in October last year when Case noticed they were being followed. The things pursuing Case and Coco were turkeys. 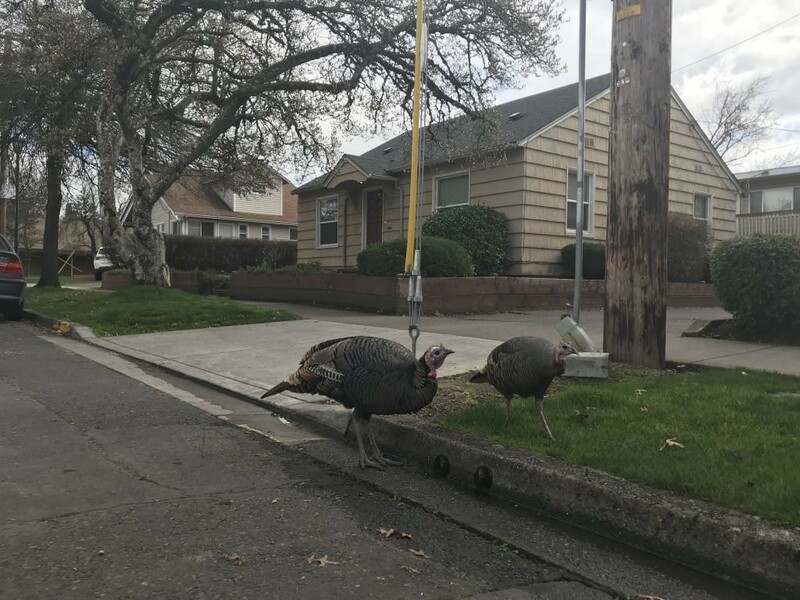 Although they make for funny pictures, according to the Department of Fish and Wildlife, the turkeys are becoming a problem by moving into city limits. ODFW biologist Christopher Yee said they risk damaging people’s properties, causing traffic accidents and, of course, chasing people and pets. Nonetheless, the city has not taken action like Yee said ODFW hoped they would. Case said she hopes something will be done with the turkeys so she doesn’t have to be afraid of something like that happening again. She still remembers having to calm down after the turkeys left and made her late to class that morning. She said her dog is about the same size as the turkeys, but Coco didn’t care much. 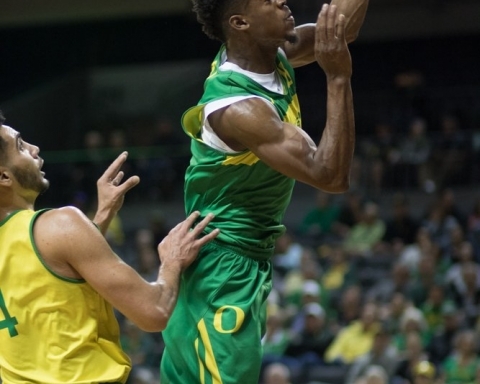 This situation is something that Yee warned is a risk of having the turkeys in Eugene. He also said turkeys are often particularly attracted to chasing around pets. 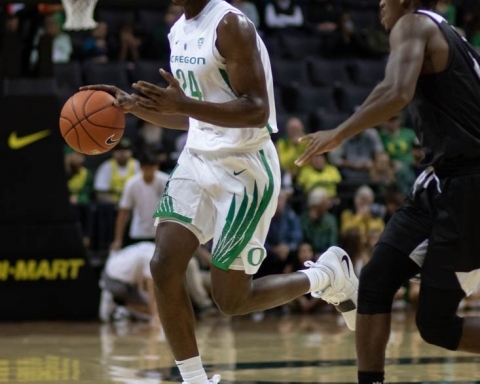 The turkeys were introduced into Oregon in the 1990s as a game bird, according to Yee, amid some debate about whether the animals were native to the state or not. Yee said the turkeys were initially placed in areas where they wouldn’t interfere with homes or businesses. Since then, because of population growth, people transporting them and people feeding them, the animals have found their way to Eugene. And he sees no reason for them to leave anytime soon since they are so easily fed. One way to help get the turkeys out of the city is to reduce the instances of people feeding them. Yee said ODFW is working with the city of Eugene to create a no feeding ordinance as they have in other cities like Corvallis and Veneta. Yee said these ordinances only prohibit people from feeding the animals if feeding them is causing damage to others’ properties. He emphasized a difference between intentionally feeding the turkeys and unintentionally feeding them. Another problem with animals brought to the area for hunting is that hunting is illegal inside city limits. Yee said the birds also risk causing traffic accidents and damaging landscaping and property. UO facility services landscape supervisor Phil Carroll said they “don’t do anything” in terms of the groundskeeping crew, and there’s no specific management actions they take because of them. “They are just out there on campus like any other two-legged creature, and we go about our business in our usual way and they go about their business,” said Carroll. If students cross paths with turkeys on campus, Yee warned it’s important not to attempt to chase them off. Yee said in terms of traffic accidents, if drivers hit a turkey, it’s treated the same as a driver hitting a deer or a raccoon on the road. Unless intent can be proven, there is typically no ramifications for the driver. While the Eugene Police Department said they don’t have any record of any incidents involving the turkeys, UO Police Department public information officer Kelly McIver said they were called on Wednesday to help move two turkeys from the parking garage outside of the HEDCO Education Building. “The city needs to step up and take [the turkeys] seriously or it’s going to get worse,” said Yee. The post Campus turkeys pose threat to duck country appeared first on Emerald Media.